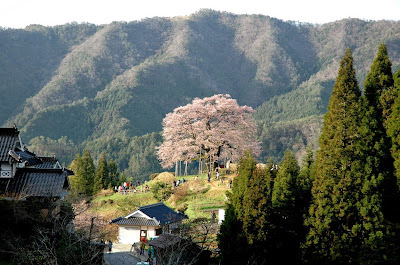 The Daigo cherry tree is a huge tree in the Chugoku mountain district in Western Japan, its age is presumed to be more than one thousand years, its height is 18 meters, and its trunk is 9 meters round. It is located on a predominant hill within a steep valley in a small mountain community in Ochiai, Western Japan. In the 14th century, when Emperor Godaigo passed this area, he already admired this cherry tree. Therefore this tree is called the Daigo cherry tree in his memory. During the flowering season many visitors come from all over Japan to enjoy this majestic tree and maybe compose a haiku in his honour, which is then posted in the box placed nearby at the little tea stall. Since the tree is so old and huge, he is supported by many wooden poles and his trunk is fortified with concrete to support the enormous weight of all the branches. The local villagers take really good care of their oldest friend. Godaigo lived in troubled times. In exile in Yoshino he came to love cherry trees. is one of Tokyo’s most beautiful, Japanese style landscape gardens. Built around 1700 by Yanagisawa Yoshiyasu, Rikugien literally means "six poems garden" and reproduces in miniature 88 scenes from famous poems. 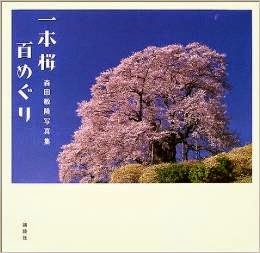 There is even a book about this subject by Mr. Arita, visiting the most famous 100 lone-standing cherry trees in Japan. Mr. Arita thinks, the power of the trees which stand alone for more than one thousand years is very strong. They have to withstand nature all alone, nobody around to help them or encourage them. Cherry trees in a park have more kindred spirits of the same kind around them, so their life power is much weaker and many do not live more than 70 years or so. so pityful . . .
Shorenji and Korinji Buddhist temples, which are now submerged under the dam lake. The local village people loved these trees dearly. pity for these two magnificent cherry trees to be submerged under the dam lake. J-POWER requested the leading researcher in the field of cherry trees, Shintaro Sasabe, the Sakura doctor, to undertake the transplanting of these two trees, and this was successfully accomplished. This was a major transplanting project without precedent worldwide that many experts in the field said would be impossible, and it was completed in December 1960. 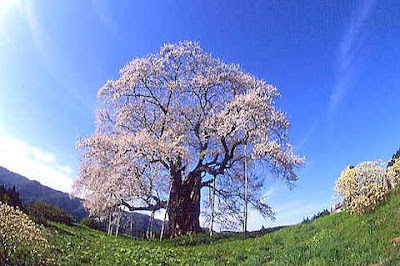 These trees are now known as the Shokawa Sakura, and since that time, we have cared for these trees. A giant cherry tree transplanted in Mihoro Dam lakeside (national road No.156) in Shokawa village of Ono District, Gifu Prefecture. This cherry tree was transplanted from the temple precinct which was to be submerged with construction of Mihor Dam, and was designated to Gifu Prefecture natural monument in 1966.
replanting of the second generation Shokawa cherry. Their huge, twisted, moss-covered trunks and their branches, which spread from the lake to the highway, propped up on posts the size of telephone poles, presented a stark contrast to the unluckier trees, drowned and black, whose branches stuck up, unsignposted, out of the fammed green water."